Former Davao City Mayor Sara Duterte-Carpio is the new face of Choice Mart by NCCC. Inday Sara, as she is fondly called, is a lawyer by profession. She is best known to be Davao City's first woman mayor and the youngest to hold the position. She is also the daughter of the incumbent mayor, Rodrigo R. Duterte. Infamous for her firm leadership style, Inday Sara embodies the characteristics of new generation moms. "Her choice to focus on being mother to her two kids and a loving wife to her husband above all else makes her fit to become NCCC?s ambassadress," says Jojo Canda, NCCC Supermarket Vice President. After serving the public for one term, Inday Sara returned to private law practice allowing her to balance her time between family and friends. Moreover, Choice Mart by NCCC is a Davao-based retail chain offering a wide selection of goods and services such as grocery items, housewares, bills payment, delivery service and food choices on-the-go giving Davaoenos a hassle-free shopping experience. Choice Mart, a smaller format of NCCC Supermarket, is the destination of choice when it comes to the day-to-day consumer needs especially because of its accessible location in residential communities. Busy mommies will find Choice Mart?s Grocer-ring delivery service convenient as they can call the store anytime to restock their pantry with their kids' snacks and other food items. Preparing meals for the family is also a breeze as the freshest choices of meats, fruits and veggies are made available. Choice, NCCC's house brand, offers budget-friendly household necessities ranging from food to non-food items as an alternative to mainstream brands but still of good quality at reasonable prices. Also available are smart deals like Choice Saver's and Fresh Specials where shoppers can get up to 50% off on selected fresh, frozen, chilled, breads, dairy, seafood and meat products. Another feature of the store is their bills payment counter where consumers can easily pay utility bills, credit card and even airline tickets. Choice Mart even has food carts so the whole family can munch some of their food cravings on the way out. "With Choice Mart, mothers need not spend much of their time running errands since the store pretty much has it all in one stop sparing them from the hassle of traffic and high transportation cost," says Canda. Furthermore, NCCC Rewards Club members can take delight in using their rewards card in any Choice Mart branch to avail of exclusive discounts, earn more points and use earned points to pay for the purchases. 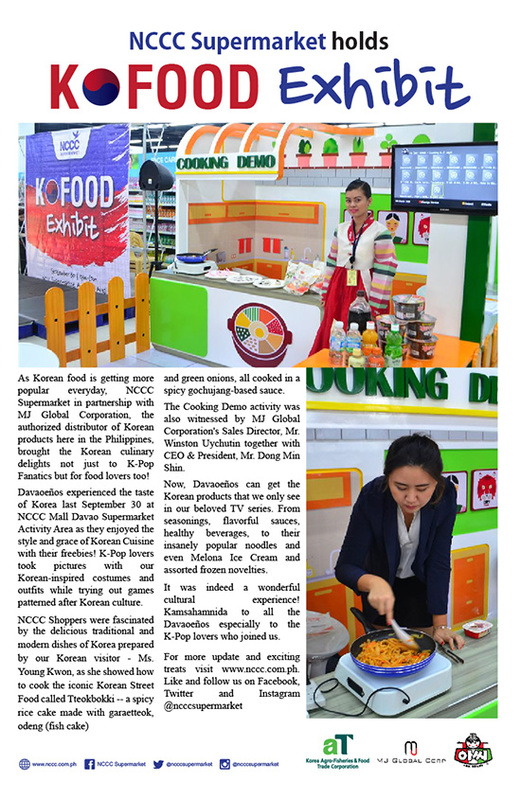 "Choice Mart by NCCC intends to reach out to more customers by expanding its brand closer to residents in nearby residential communities in Davao City and other neighboring Municipalities in Mindanao. Currently, there are five Choice Mart stores in Davao City, and more branches are expected to open in 2016 as part of its expansion efforts," Canda added. For a hassle free shopping of your everyday needs, visit Choice Mart stores located at The Woodlane Shoppes, Damosa Gateway, Catalunan Grande, Nova Tierra and Landmark. Stores are ready to serve shoppers as early as 8am. 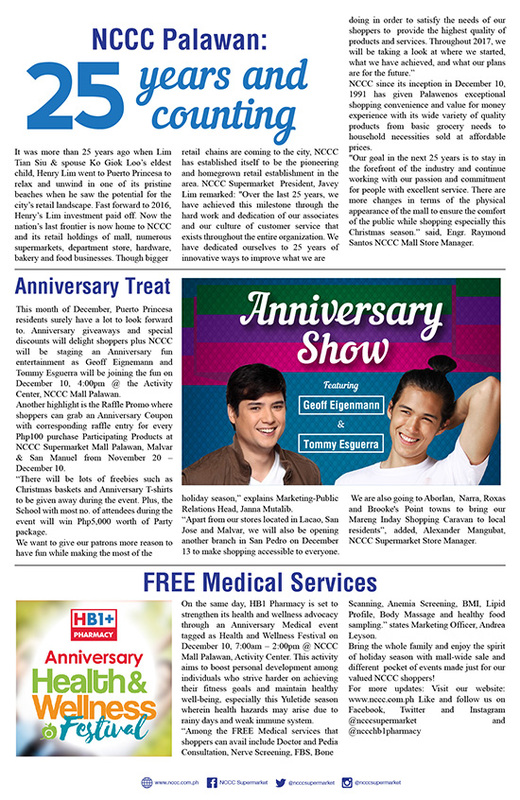 A variety of surprises await patrons of NCCC as it celebrates its 39th anniversary. ASAP cover boy Tanner Mata headlines NCCC Supermarket’s Anniversary Party on December 1, 4pm at NCCC Mall Davao Activity Center. Joining him are Tawag ng Tanghalan alumni Sam Mangubat and Eumee Capili with Kyle Echarri from The Voice Kids. Fresh from her win in the Himig Handog 2017, Moira Dela Torre will also take part in the celebration. On the same day, NCCC Mall Tagum will kick off StrEAT Food Fest at the open space parking lot. Food stall choices include The food market Master Sisig, J-bites, Tita Rosita’s, Eduardo’s Kitchen, Hungry, Steak ni Juan, Sabroso Café Bistro, Balinsasayaw, Wingmaesters, Tiffany Ice Cream, JM’s Shawarma, Taco Boy, Greenwich, Pepsi, and Fruit Stand One. The food market will run December 1-3 from 5:30-9:30pm. December 1 also marks the start of the holiday weekend sale. Save up to 70% on your shopping plus avail of price-off coupons worth P200 and P500. Similarly, NCCC Department Store is set to launch Biyahero 001, an all-around travel partner brand which offers affordable and high quality travel essential items that are innovative, well-built and attractive. Meanwhile, #Hashtags Paulo Angeles, Jon Lucas, Nikko Natividad, Tom Doromal, Jimboy Martin, and Jameson Blake invade AnniverSAYA sa Puerto Princesa on December 10, 4pm at NCCC Mall Palawan Activity Center. To know more about the latest updates, visit the social media accounts of @ncccsupermarket, @ncccdepartmentstore, @theofficialncccmallpalawan, and @ncccmalltagum. November 28, Davao City – New City Commercial Corporation (NCCC), Davao’s homegrown retail chain, partners with GCash for a hassle-free and secured cashless payment. “We at NCCC are committed to provide our customers with the highest quality of customer service. Electronic payments via QR is the wave of the future and we want our customers to experience it now with the help of GCash,” said Tjader Regis, NCCC Supermarket Senior Vice-President. A first in Mindanao, customers can now pay electronically through the use of QR scanning via smartphones. To do so, download the GCash App for free via Google Play Store for Android phones and App Store for iPhone. It contains several ways to use GCash, one of which is the Pay QR. Once chosen, it will prompt the user to point the camera towards the merchant’s QR sticker for automatic capture. The customer will then input the amount to be paid and money will already be transferred to the account of the merchant electronically. The GCash wallet can be loaded at any of the over 12,000 GCash cash-in outlets nationwide. Aside from Cu, also present during the launching are GCash president and CEO Albert Tinio, NCCC chairperson Helen A. Lim, and NCCC president and CEO Lafayette Lim. GCash, operated by Mynt as owned by Globe Telecom, Ant Financial and Ayala Corp, hopes to change the purchasing payment landscape in the Philippines, strongly believing that cashless transactions will be the next big thing in the retail industry. It strives to promote cashless transactions in the country to reach more Filipinos by partnering with key market players and top companies beginning with Mercato and Glorietta. GCash is the pioneer in electronic payments system in the Philippines that uses QR codes instead of cash to pay for goods and services. Learn more about GCash by visiting www.gcash.com. Follow GCash and NCCC on their social media channels: www.facebook.com/gcashofficial, www.twitter.com/gcashofficial, www.instagram.com/gcashofficial and www.facebook.com/ncccsupermarket, www.twitter.com/ncccsupermarket, www.instagram.com/ncccsupermarket. NCCC Mall Buhangin is targeted to open by August 2018, an executive of the LTS Malls Inc., said. "When we open...all tenants will be open there will not be empty spaces anymore," said Sharlene Faye A. Lim, LTS Malls, Inc. president, at the sidelines of NCCC Mall Buhangin's topping off ceremony on Tuesday, October 31, 2017. She said they will start the turnover of leasable areas to the tenants by December this year. Lim added that NCCC Supermarket will come in by December to start with their setup while the NCCC Department Store will come in by January. Then by February, Lim said, the other tenants can start with the construction of their stores. George Consunji, Chairman of DMCI, said they are currently ahead of schedule in the construction of the mall and assured that they will be able to finish on time. The 8,100 square meter (sqm.) upscale retail and commercial center will feature local, national, and international brands for Dabawenyos. Designed by Asya Design and DMCI as construction partner, NCCC Mall Buhangin is located at the Tigatto-Mandug road, Davao City. The mall will have five levels. First level houses the basement car park; the second level will have the supermarket and retail shops; the third level will house the department store and other retail shops; the fourth level will be the location for services, gadgets, and kids' zone; and the fifth level will have the cinemas, rood deck, and retail shops. The cinemas are equipped with the latest Dolby Atmos Sound Technology, with a 7.1.4 Dolby Atmos system. The NCCC Mall Buhangin is also designed as a green building featuring environmentally friend technologies on energy saving and water usage. It also has highly-efficient air-conditioning system for air flow and skylights for natural lighting. John Lloyd Tejano and Weam Ahmed are NCCC Department Store's newest abassadors. Tejano, 18, was also named Mr. No Sweat and Male Voter's Choice. On the other hand, Ahmed, 18, was awarded Ms. Ponds and Ms. Photogenic. Likewise, Joshua Kareem Thompson and Kathleen Dela Peña won 1st runner up while Abraham Yahya and Arianne Charl Almaden were named 2nd runner up. Thompson took home the Mr. Ponds award while Kathleen Dela Peña was awarded Ms. Converse. Yahya got the Mr. Swallow award while Almaden won Ms. No Sweat and Female Voter's Choice. Other special awards winner include Mr. Acne Care and Ms. Snowcaps Al John Bana-ay and Irra Loise Nebrada, Mr. and Ms. Skin Lite Francisco Bonguyan III and Trixie Marie Cabiles, Ms. Swallow Alexis Gapuzan, Mr. Converse Nhill Charl Barol, Mr. and Ms. Congeniality Mark Josweph Tuñacao and Yuki Ung, and Mr. Photogenic Francisco Bonguyan III. NCCC opens its 20th Supermarket and 18th Hardwaremaxx branches in Mati City on October 27, 2017. The 2,000 square meter store is located beside the public market. Charismatic, stunning and confident are words that best describes the finalists of NCCC Department Store’s Teen Model Search. “The home grown model search aims to aid in the personality development of teens and also up their fashion experience,” says Mia Flor Parais, NCCC Department Store Sales and Marketing Manager. She added that the top 20 teens will undergo workshops on make-up and grooming, ramp modeling and personality enhancement. Before rounding off the search for the newest NCCC Department Store ambassadors, get to know the top 20 finalists who bested 297 other hopefuls from all over Davao region. At the young age of 15, Carl Jasper Arbis sees to it that he gets enough sleep so to “maintain my body healthy and young.” Despite being body conscious, Carl admits eating chocolates and drinking soft drinks are his guilty pleasures. Hospitality management student, Josh Neil Rhyme Dale Melodi, apparently loves cooking and mixing drinks. His love for food even translates to his dog by naming him Kimchi. Josh, 19, is more of an eater than a sleeper. It does not come as a surprise that Mark Joseph Tunacao, taking up AB English, is best at public speaking. The 19-year-old says he does not eat much carbs but is fond of trying out products offered in free taste booths. Aside from doing push-ups every morning, John Lloyd Tejano, 18, drinks milk and eats a lot of fruits to maintain his bod. When not in school, the business administration student can be found at home bonding with his family. Before going to sleep, Yuki Ung rubs ice on her face for a glowing skin. Books, phone, family and friends are the things that Yuki cannot live without. At 17 she likes to dress in trendy clothes. Irra Loise Nebrada is currently taking up Tourism in Philippine Women’s College. She is a member of the volleyball team and stays in shape through training. She describes her style as classic and sophisticated. Princess Floree Aluiz enjoys eating “because food is life” but disciplines herself to consume only healthy and protein-rich foods. For Princess, 18, dancing and modeling are her forte. 18-year-old artist Wean Ahmed loves to sketch. She goes on a diet to achieve her desired figure although in between confessed to eat extra burgers than allowed. Being a varsity player doing physical training four times a week helps Kathleen Dela Pena stay in shape. She also keeps away from stress by getting some snooze. Kathleen, 18, spends most of her free time in the library to find peace. Proper and diet and exercise are some of Christelle Joy Caldazo’s beauty regimen. She believes in the importance of intelligence “because beauty will fade but knowledge is forever.” Christelle, 17, is comfortable in casual clothes. Chef in the making Trixie Cabiles has a handful of pets, nine to be exact. She says that she wants to be someone whom the youth of today could look up. Optimism is her mantra and turning negative vibes into positive is what she’s good at. The five things you can find inside the bag Arianne Charl Almaden are eyebrow pencil, phone, body lotion, water, and lip tint. Arianne, 17, limits her soda intake to be fit. Her style preference is casual, edgy, and sophisticated. Completing the top 20 are Alexis Gapuzan, Justine Monteiro, Abraham Yahya, Francisco Bonguyan III, Al John Lawrence Bana-ay, and Nhill Charl Barol. NCCC Department Store’s model search has produced a number of local personalities like Chinoy TV host Janelle Tee and Hashtag member Tom Doromal. Watch out for these teens as they vie for the title of Teen Model Search grand winner on October 28, 2017 at NCCC Mall Davao Activity Center. 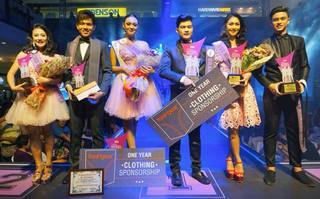 Two winners, one male, and one female, will each receive P30,000 plus a P60,000 worth of apparel from Freshgear. While first and second runners-up will take home P20,000 and P15,000, respectively. Other special awards include Mr. and Ms. Refreshing Smile, Mr. and Ms. Photogenic, Mr. and Ms. Ponds, Voter's Choice, Mr. and Ms. Snow Caps, Mr. and Ms. No Sweat and Mr. and Ms. Congeniality. This year's Teen Model Search is presented by Freshgear, Biofresh, Eskinol, Master, Rexona, Ponds, Ponds Men, Burlington, and Puma. Not all heroes wear capes, some have four legs and a tail. To honor of all hero dogs, Hardwaremaxx prepared a jam-packed half day Dog Congress on October 7, 2017, 1pm at NCCC Mall Davao Kadayawan Hall. “The 9th Dog Congress is now bigger and better. With the opening of our Maxx's Pet Bowtique and Pawlor earlier this year, we have added specialized services so as to attract more dog lovers to join,” says Hardwaremaxx marketing officer-in-charge, Christopher Cua. He added that the annual congress is open to all pet lovers who wish to avail an assortment of exciting freebies and services such as loot box, anti-rabies vaccination, check-up, consultation, dog food sampling from GoodBoy, Pedegree, Vitality, PetOne, and Eukanoba, and pet blessing (domesticated animals). There will also be a raffle draw, free ice cream and popcorn for dog owners, face painting, and photo booth. A dog show and a puppy class will also be included in the list of activities. True to its theme, Heroes Carnival, are different games including Hawkeye challenge (darts), Superman challenge (marble drop), Captain America challenge (roleta), Batman challenge (shoot that ball), Green Lantern challenge (shoot that ring), Iron Man challenge (wire loop), Spiderman challenge (coin toss), and Black Widow challenge (shooting range). Likewise, special awards will be given to participants with the most amazing superhero costume, the best partnership, the most striking persona, smoothest and shiniest hair, smallest and biggest size, friendliest dog, most behave, handler who brought the most number of dogs, and a Hardwaremaxx Choice Award. Winners will each receive five kilos of Maxx dog good plus certificate. Participants will have access to Maxx's Pet Bowtique and Pawlor Booth. Hardwaremaxx will also offer free grooming to the first 15 participants who bought P500.00 worth of goods from Maxx's Pet double display, another 50% off on grooming for the first 20 registrants and for MAXX VIP card holders, while the 21st to 50th registrants can avail a 20% discount on Grooming. Also, one lucky dog will be randomly chosen per hour starting 12 noon up to 5 pm. They will take home 5kg of dog food. Join the finest, merriest and grandest event of the year- the Kanegosyo Congress. Now on its 18th year, the congress will run from September 14-16. The 3-day fair is an exclusive event held yearly for the chain's loyal Rewards cardholders. Opening the exhibit grounds is Choice Mart ambassadress, Inday Sara Duterte. "This event is a way to thank our customers by giving them good prices for products they can use for their businesses," says Jayson R. Fuentes, Marketing Manager, LTS Retail Specialists, Inc. The event will have 74 booths set up with products from Unilever, Nestle, Procter & Gamble, and PMFTC Inc. Each exhibitor will dress up their booth according to this year's theme, Universal Studios. Pegged after the theme park, the congress will also feature numerous attractions and live shows. Shoppers can avail of exclusive premium deals, special bundles, exciting freebies, and prizes during the 3-day event. Kanegosyo premium members can enjoy exclusive shopping on the first day from 8am to 12 noon while Rewards premium members can enter from 1pm onwards. At 4pm on September 14, award winning actor James Blanco makes a guest appearance while The Voice Teens PH finalist Jeremy Glinoga greets shoppers the next day at the same time. On September 16 at 2pm, Kanegosyo partners will have the chance to participate in the games prepared by Maggi together with the Queen of Philippine Soap Opera, Judy Ann Santos. It’s all about food, health, and stars in the week-long commemoration of the King of all Festivals. 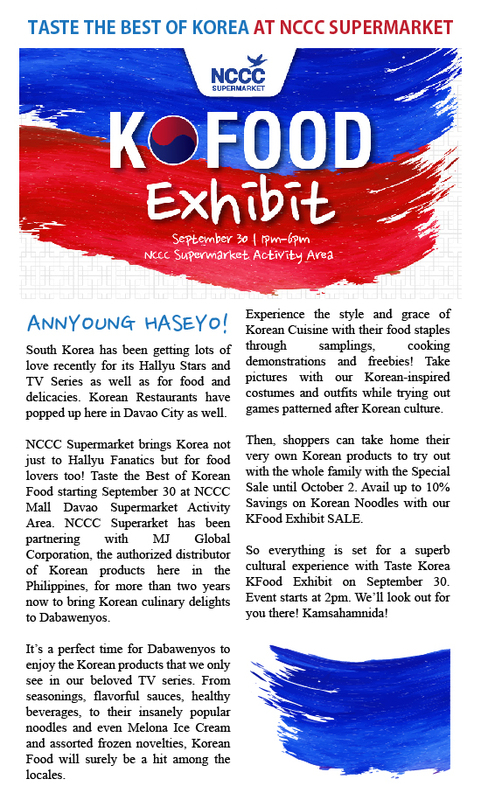 Starting with the Kfood Festival on August 18 at NCCC Mall Davao supermarket area, shoppers need not to fly to Seoul to taste and experience the best of Korea. They can immerse themselves to try and learn some traditional Korean games, cooking techniques, and of course try their food. Kpop fanatics may even indulge into some authentic goods since the supermarket has a special lane for Korean products. Take advantage of the long weekend and check on your health by visiting the medical caravan by HB1 Pharmacy happening on August 19, from 7am to 12 noon at the activity center. Dabawenyos will have free access to different medical and wellness services including consultation, FBS, eye check-up, dental services, and healthy food samples. After heeding the doctor’s advice, head on to the activity center at 4pm as stars will head down south in Kasadya ug Musika sa Kadayawan featuring Dominic Roque, Albie Casino and RK Bagatsing. Both Roque and Casino appeared in FPJ’s Ang Probinsyano while Bagatsing currently stars Wildflower opposite Maja Salvador as the infamous Mr. Mayor. Also performing is Davao's own and the very first The Voice Teens grand winner, Jona Soquite. Likewise, NCCC Mall Davao showcases Davao’s rich culture and heritage with Sayaw ng Kulturang Pilipino Inter-School Competition on August 20, 1pm. Fifteen private and public elementary schools will compete to bag the P10,000 first prize while the second and third runners-up will receive P5,000 and P3,000, respectively. On the same day, the fun continues as the lead stars of "100 tula para kay Stella", Bela Padilla and JC Santos, bring entertainment to Dabawenyos. The film, featured in Pista ng Pelikulang Pilipino, is about a stuttering college student who writes 100 poems for Stella, the university rock chick. Joining Padilla and Santos is The Voice Teens semi-finalist, Chan Millanes. The show starts at 4pm. Audience of Kasadya ug Musika sa Kadayawan will get the chance to take home cinema tickets or NCCC gift cards. 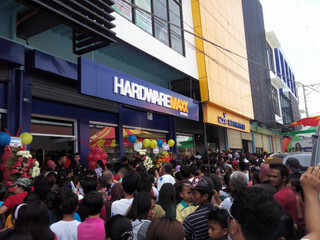 Also, NCCC Department Store and Hardwaremaxx are on sale until August 20. 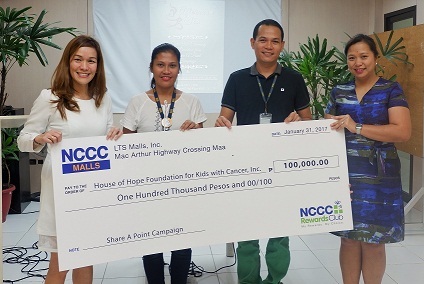 NCCC Rewards Club OIC, Vergelyn delos Reyes (second from left) turns over a check worth P100,000 to Cheryl Leilani M. Gomez (left), manager for fundraising of House of Hope Foundation for Kids with Cancer, Inc. from its Share a Point and Win a Holiday Basket promo. The campaign collected points from NCCC Rewards Club members in Davao, Tagum and Palawan and convert them to cash. Also in photo are NCCC Cares manager Joan Dela Pena (second from right) and NCCC Malls AVP Althea D. Lucas. NCCC LAUNCHES LTS RETAILS SPECIALISTS, INC.
NCCC affiliated brands merge to form one, stronger company – the LTS Retail Specialists, Inc. These brands include NCCC Supermarket, Choice Mart by NCCC, HB1 Pharmacy, Breadfactory, Citifoods and Munchies. NCCC Supermarket and Choice Mart by NCCC were previously under LTS Supermarkets, Inc. while HB1 Pharmacy was under LTS Community Stores, Inc. Breadfactory, Munchies and Citifoods, on the other hand, belonged to LTS City Foods, Inc. The Davao City based retail chain has a total of seven business units namely LTS Retail Specialists, Inc.; LTS Malls, Inc. which manages all the mall operations in Davao, Palawan, and Tagum; LTS Department Stores, Inc.; and LTS Hardwares, Inc. In support of the program of Department of Agriculture, LTS Retail Specialists, Inc. advocates buying direct from local farmers. “We actually had a talk with Sec. Pinol of the Department of Agriculture when he was working on the idea of giving fruit farmers direct access to supermarkets. He did mention that DOA is working out on a system with which the onion farmers of the country, especially those from Bongabon, Nueva Ecija, will be able to deliver their produce to these chain of Supermarkets,” relays Tjader P. Regis, NCCC consultant. In support of the said system, LTS Retail Specialists, Inc. vice-president Teresito N. Canda said that “We already are sourcing fruits and vegetables from local farmers. We buy from them directly. We are committed to do this program for sustainable development. Our Merchandising Department – Fresh Category is still looking for more farmers so we can increase exposure of our local farmers to more shoppers. Regis further added that the NCCC Group of Companies is glad to be part of this advocacy and that giving a chance to local farmers will definitely contribute an improvement on their farming practices, resulting in higher production levels and better quality crops while conserving the country’s environmental resources. In turn, the partnership will lead to secure supply of quality local produce fresh wherein all the shoppers will benefit. Kanegosyo Congress: Ka-Partner mo sa Pag-Unlad for 17 years! A hand full of exclusive treats, discounts, prizes, fun games, entertainment, celebrities and more surprises is in store for the members of NCCC Rewards Club in the most anticipated Kanegosyo Congress 2016 from September 15-17, 2016 at Kadayawan Hall, NCCC Mall Davao. The congress aims to equip small and medium entrepreneurs with opportunities including immediate and long term solutions to improve their business and be profitable and sustainable. The annual special selling, now on its 17thyear, will have a total of 50 exhibitors including NCCC affiliated companies. These booths offer special treats on top of exclusive discounts plus great deals on product bundles. Product samplings are also available during the 3-day event. "This year's theme is United Nations. We asked each exhibitor to dress up their booths accordingly so that the customers will have a feel of the theme as if immersed to different places," says Melanie Bacala, Marketing AVP. She added that, "this event aims to give our NCCC Rewards Club members more reasons to stay loyal and to strengthen our relationship with them not to mention encourage more shoppers to avail of the membership." "I have been loyal member of NCCC Rewards Club ever since I opened my Sari-sari Store. 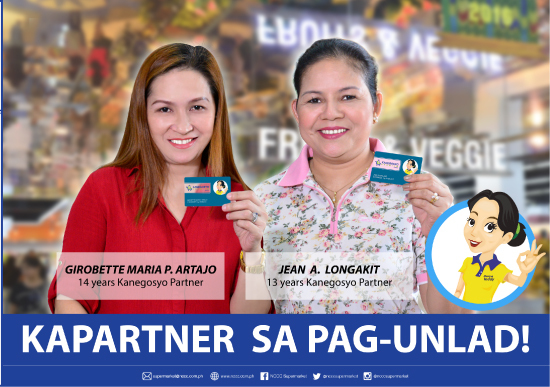 Every year I look forward to attending Kanegosyo Congress where entrepreneurs like me can get more savings on top of discounted items," says Jean Longakit, Kangeosyo Premium Card member. Additionally, Top Kanegosyo Partner Girobette Artajo, quipped, "It opens opportunities for us to earn more when we resell the products at standard retail prices." Aside from the top kanegosyo partners, exhibitors will also be awarded with various awards including the best Booth, Patok na Patok Award, Most Bibo Merchandising, Early Bird Award and Congeniality Award. 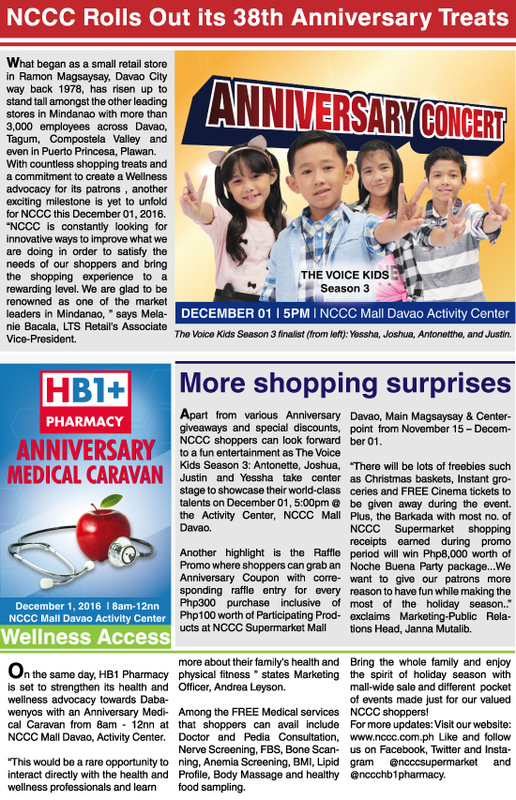 Kanegosyo Congress is open to more than 200,000 NCCC Rewards Club members. The card will serve as their access ti endless discounts, perks and other privileges. Let all the dogs out this October 1 as Hardwaremaxx stages the 6th Dog Congress at Kadayawan Hall, NCCC Mall Davao. ?Dog Congress is an annual event that brings together dog lovers and enthusiasts alike across Davao region. Different free services are available such as anti-rabies vaccination, check-up, grooming, consultation, and pet blessing,? says Rhyan Jee Selorico, project coordinator. He added that there will be food sampling, accessories selling as well as fun games. Likewise, the congress will feature the much anticipated fashion show where dogs will have the chance to strut their poses during the parade of national costume in line with the theme ?Pinoy Fiesta?. The stand out dog will receive a plaque, P2,000 cash, P1,500 worth of gift certificate and one sack of dog food. While the 1st and 2nd runners up will take home P1,500 cash, P1,000 worth of gift certificate and P1,000 cash, P500 worth of gift certificate, respectively. A number of special awards will also be up for grabs namely: Best in Casual, Best in National Costume, Best Team Up, Crowds Favorite, Most Shiny Hair, Smallest Dog, Biggest Dog, Hardwaremaxx Choice Award, and Vet Partners Choice Award. Moreover, there will also be a picture perfect photo contest with the subject ?Me and My Bestfriend: Proud to be Pinoy!?. Winning entry will get a plaque, P1,000 cash, P1,000 worth of gift certificate plus one sack of dog food. The 1st runner up will receive cash prize worth P1,000, gift certificate amounting to P500 while the 2nd runner up takes home P500 cash, P500 worth of gift certificate. Voter's Choice Award and Lucky Voter will also be awarded during the event. Celebrate Kadayawan with a healthy vibe. HB1 Pharmacy introduces an alternative and healthy way to celebrate Kadayawan with Zumba Festival on August 20, Saturday, 7am at People's Park. More than 500 enthusiasts are expected to shake and move to the beat in the grueling three-hour fitness routines. Participants who wish to join the Zumba Costume Contest should wear their most colorful outfit for a chance to take home P1000 worth of NCCC and SPA Gift Certificates, non-winners will also receive Gift Packs. Shoppers are entitled to one (1) Kadayawan Zumba Fest coupon with corresponding raffle ticket for every P100 worth of Enervon, Revicon, Conzace, Enervon Activ, Enervon HP and Safeguard at any HB1 Davao branches. The same also entitles a participant to avail of FREE Medical Services instant freebies and many more! Be part and get ready to show off your Best Zumba Outfit and experience an exhilarating fitness moves for a healthier you. See posters and print ads for more details. Per DOH FDA Permit No. ROXI 023 s. 2016. Stay healthy and feel FABULOUS with HB1 Pharmacy. Visit www.nccc.com.ph, like and follow us on Facebook, Twitter and Instagram @nccchb1pharmacy for more updates and exciting treats.